Janković returned to the leadership of Positive Slovenia late last month after engineering a putsch ousting Bratušek as leader. That, in turn, unraveled the coalition that Bratušek built in February 2013. In 2011, Janković, who was then (and still remains) under investigation for misue of power as Ljubljana mayor, was unable to form a governing coalition, with potential partners worried that Janković would use the premiership to block further inquiries into his past misdeeds as mayor. The same issues are driving Positive Slovenia’s current coalition partners away from Janković now in 2014. Instead, Janez Janša, who previously served as prime minister between 2004 and 2008, led a coalition of his own center-right Slovenska demokratska stranka (SDS, Slovenian Democratic Party), which holds 26 seats, and four other small parties that together held another 24 seats. The unwieldy conservative coalition collapsed in February 2013 after Janša’s own corruption issues came to light in a new national report on public misconduct throughout the entire Slovenian political system. On the basis of the report that, incidentally, also implicated Janković, Janša was convicted on corruption charges four months later. An appeals court upheld the ruling and a two-year prison sentence just a couple of weeks ago. Considering that Janša’s government fell over the issue of public graft, it was clear that Janković could hardly lead the next government. Janković begrudgingly renounced his leadership of Positive Slovenia, and Bratušek stepped in as leader, quickly concluding talks to lead a four-party coalition that included Positive Slovenia and Slovenia’s traditional center-left party, Socialni demokrati (SD, Social Democrats). At the time, SDS leaders joked that her government would be shorter than her skirt’s length — and they may have been right. But Bratušek won a key vote of confidence last November that avoided a humiliating bailout, if not a punishing round of budget cuts. In 2012, Slovenia’s government provided a €3.3 billion infusion to rescue Slovenia’s banks, by now a familiar pattern among Europe’s troubled economies. Bratušek’s government has tried to come to grips with the financial fallout from that decision, slashing the budget deficit from nearly 15% of GDP in 2013 to around 4% this year. She’s also tried to start privatizing many of Slovenia’s nationalized industries, including many of its banks and energy companies. The public sector controls around half of the Slovenian economy, so selling many of those industries could unlock greater efficiencies and higher GDP growth. Slovenia’s economy has contracted in four out of the past five years, and it’s expected to post just around 0.8% growth in 2014, hardly a return to the uninterrupted high-growth days of the 1990s and early 2000s. Polls generally show that if an election were held today, Positive Slovenia would fall far behind both the conservative Slovenian Democratic Party and the more leftist Social Democrats, who are essentially tied in first place. 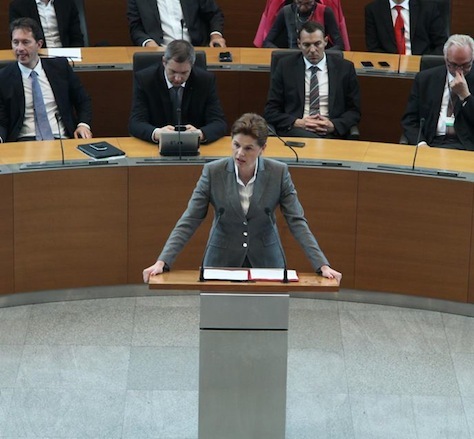 As far as Balkan nations go, Slovenia’s politics are incredibly unconventional. It’s a small, nearly landlocked, Adriatic nation of just 2.05 million people, with strong ties to Italy and Germany (though both countries occupied it during World War II). Along with Croatia, Slovenia was among the first countries to break from Yugoslavia in 1991, and it was largely spared the horrors of ethnic cleansing and warfare that marked Serbia, Kosovo and Bosnia and Herzegovina throughout the 1990s. It was the first Balkan state to join the European Union, acceding in the 10-state Central and Eastern European enlargement in 2004, and it was the first Balkan nation to join the eurozone in 2007.